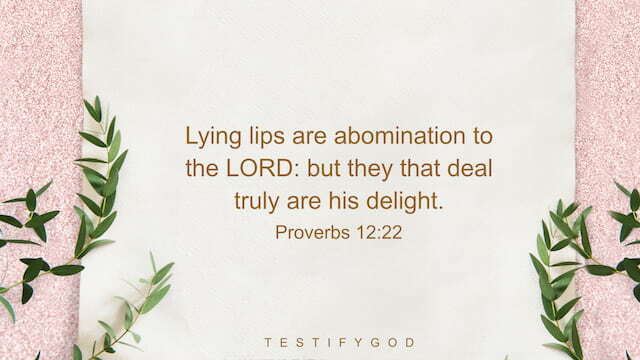 This verse tells us that God loathes those who are deceitful and loves those who are honest in their words and actions. God demands man to be honest because God is faithful. Jesus also said, “Truly I say to you, Except you be converted, and become as little children, you shall not enter into the kingdom of heaven” (Mat 18:3). Then, what we should do to be honest persons? First, speak the words of our hearts when we pray to God. We can speak honestly to God according to our difficulties or our sufferings. When we pray to God with a true heart, He will enlighten us. However, if we just say something pleasant to achieve our aims in prayers, then such prayers are deceiving God. Jesus teaches us: “But let your communication be, Yes, yes; No, no: for whatever is more than these comes of evil” (Mat 5:37). So, we need to be honest when we pray. Second, no lies in speech or deceit in the heart when we interact with others. In our real lives, we have to interact with others. During this process, if we tell lies to others just for our interests, then we are not honest persons. When we realize that we have done something wrong, we need to bravely admit our mistakes to achieve true repentance and change. Don’t talk the talk but walk the walk.